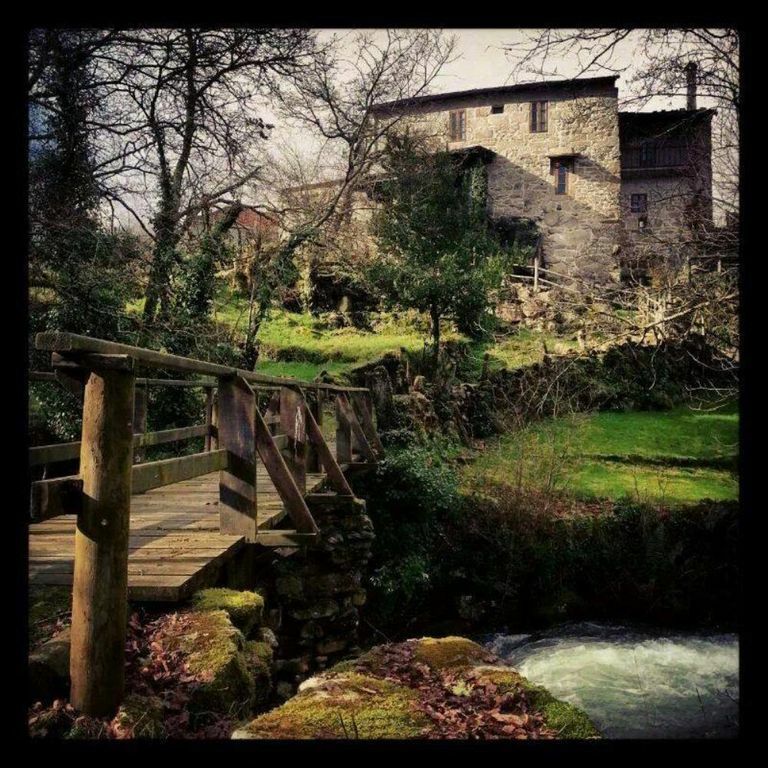 Casa da Laxa is located in beautiful land of Terra de Montes on the border between provinces of Ourense and Pontevedra. It was built in traditional Galician manner in 1875 on a granit rock in the veil of Marcofán mountain. Peace and natural beauty of the Castro river's bank makes this stunning cottage a perfect getaway destination. Our hosts could not have been more welcoming or more generous. Everything is so thoughtfully done. Particularly special is the attention to detail of the traditional Galician buildings. Go there, it's wonderful. Una de las mejores casas rurales que hemos estado, y hemos estado en varias. La casa impecable con todos los servicios cubiertos de sobra. Intalaciones limpias y muy bien cuidadas. En el exterior jardin con barbacoa y un río de ensueño así como los alrededores. Mención especial a Marta y Pilar, por su trato y hacernos aun más agradable la estancia. Great time at Casa de Laxa! We stayed in the house in the end of August. Although some time has gone, it is kind to remember the time which we spent at Casa de Laxa. Perfect, quiet, calm place, suitable for deep sleep:) The rushing stream and mornings in the clouds - the memories which remains for a long time! We would recommend this place for those who wants to rest from the fast pace of life and noise of cities and wants to mingle with a nature, enjoy the time with family or friends. Our best wishes to attentive and amazing person Marta and many thanks for the great time at Casa de Laxa!!! "The house and its various gardens were all fantastic, and we enjoyed spending time there enourmously. The house itself was very beautiful, recently refurbished to a high standard and regularly cleaned during our stay. At the edge of the village, it was very peaceful, with long views over the mountain ranges down the valley, surrounding peaks, and the rushing stream at the bottom of the garden. The stream and the garden had areas that were nicely shaded by trees when the sun shone too strongly. Finding the house was easy, even though it was tucked away; clear instructions from the owners got us to the village, where the house itself was signed clearly. The final 100m drive from the road was very narrow and steep; fortunately, we'd only booked a small hire car so access was fine, but a bigger car might have to be parked on the road itself. The covered parking space we used was useful, as it meant the car was always cool when we went out, even at midday. From the parking to the house was only a minute's walk, and there was a trolley on hand when we had to carry suitcases down and back. Basic supermarkets, post office and cafes were located in the nearby village of Beariz; better food shopping we found in the markets of O Carballino. Our children are aged 7 and 10, and they loved the house, the garden and the stream, and we felt confident letting them explore the grounds and further afield. A few years younger, and they would have struggled with some of the steep paths, so i don't think this would be a good place to relax with very young children. From the house, we went walking directly into the hills, we drove about an hour to interesting cities (Pontevedra, Ourense, Ribadavia, Vigo... Santiago was a little further) and about the same to several lovely beaches. We had a thouroughly relaxing time and would recommend this house without reservation." "This is a superbly restored old farmhouse, with excellent facilities, a wonderful garden and a stream at the boottom. The house and terraces tumble dramatically down the hillside into the river valley; it's like English woodland backed by wild Balkan mountains. Wonderful. It is pretty remote, though; daytrips are possible to interesting places and the coast, but it's best for those who want to sit and read, or walk in the hills. Bring some fly repellant. In all: a terrific, 5-star place to stay, and the hosts are kindness itself." We, 4 Adults from Germany, spent 12 restorative days in the charming and peaceful holiday home Casa Da Laxa, Magros, Beariz. It was not only the recreative center from where we started visits in an interesting part from Spain and Europe. The very friendly hosts Marta, Pilar and Bernardo did everything they could do to make our holidays so comfortable but also delivered us insight into historical and cultural aspects of their home country. They were so cordially, that made our holidays very unique. The house was well equipped and tastefully arranged. Thanks a lot!!! Possibility of guided walking trails. Request in advance. No extra charge. - Wine Tourism. Located between three Appellations of Origin: Ribeiro, Rías Baixas and Ribeira Sacra. The closest the IO do Ribeiro and other two about an hour.